1 out of 3 (33.3%) reviewers said they would recommend this vehicle to a friend. Q3 is easy to drive. Test drove this car few months ago and noticed the ride is smooth and fast despite its small engine. Kids commented it's a "Floating" Car. We like this car but the overall package offered by audi somehow was not as competitive as BMW. 3. rear seat is not as spacious as other brands of same class. 5. overall package not as competitive as other dealers. Short test drive of the Q3 2l 180hp. Very nice and roomy interior for the size. The seats are very comfortable and easy to adjust to the right position. The steering is extremely light at low speed and remains soft. The traffic did not allow for much evaluation of the chassis. Only a right turn taken briskly revealed a tendency to moderate body roll but with a slight jerk from the rear end. Was it the stability control or the rear wheel drive that kicked in? It absorbs bumps quite well. The engine is adequate for normal driving but feels a little gutless when pushed with a lack of top end. This is aggravated by the gearbox shifting too early. In manual mode it refuses to downshift until it get into low rpm. The dynamic mode is not helping. It makes the car feel unrefined without providing more umph. It is not a challenger to the Porsche Macan. Back inside, the dashboard is nicely laid out and the finishing is really good. What is not good is the standard audio system. It sounds muddy and lifeless. Went to the Q3 launch at open area near MBS, an ok event though. Tested the full specs of Q3 that comes with panaromic sunroof plus other accessories. The exterior is simply a slightly smaller Q5, which makes not much difference in styling or sportiness in it at all. Interior is a base setting, no keyless entry and only the high spec version has full accessories at a huge top up of pricings. The drive was so so....compared to the Q5 I tested, is much more umph...the Q3 is barely there and throttle it, it does not respond immediately. Overall, I would rather top up S$10k (as of current price) to get a Q5 which is more spacious and powerful to handle than the Q3. Price too steep, Q3 vs Q5 is only S$10k difference. Authorised Distributor Audi cars are Audi A3 Cabriolet Reviews, Audi A3 Sedan Reviews, Audi A3 Sportback Reviews, Audi A4 Avant Reviews, Audi A4 Sedan Reviews, Audi A5 Cabriolet Reviews, Audi A5 Coupe Reviews, Audi A5 Sportback Reviews, Audi A6 Reviews, Audi A7 Sportback Reviews, Audi A8L Reviews, Audi Q2 Reviews, Audi Q5 Reviews, Audi Q7 Reviews, Audi Q8 Reviews, Audi R8 Reviews, Audi RS4 Avant Reviews, Audi RS5 Coupe Reviews, Audi S3 Sedan Reviews, Audi S3 Sportback Reviews, Audi S4 Avant Reviews, Audi S4 Sedan Reviews, Audi S5 Cabriolet Reviews, Audi S5 Coupe Reviews, Audi S5 Sportback Reviews, Audi SQ5 Reviews. Parallel Imported Audi cars are Audi A5 Cabriolet Reviews, Audi A8 Reviews, Audi A8 Diesel Reviews, Audi Q5 Reviews, Audi Q7 Reviews, Audi Q8 Diesel Reviews, Audi S5 Cabriolet Reviews. sgCarMart is the number one car site for buying Singapore cars, including new cars, parallel import cars, Toyota, Honda, Nissan, Volkswagen, Mitsubishi & BMW. 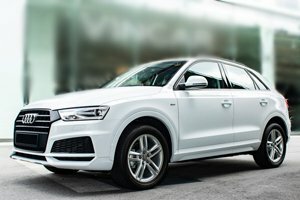 We have new car dealers comprising parallel importers, authorised car distributors, and used car dealers who have the New Audi Q3 latest price Find new car pricelists, new car launches, new car promotions, new car reviews, latest car news & car articles. Read the New.Audi Q3 consumer reviews to help you decide on buying a car. Also join our car discussion and forum discussion for car reviews, motoring news & motoring guides. Visit our partner sites who have job openings for Singapore jobs, Singapore classifieds, mover and real estate properties for sale.